FRITES Belgium on Tap: Laksa Mussels? Yes Please! FRITES has been around in Hong Kong for a few years. 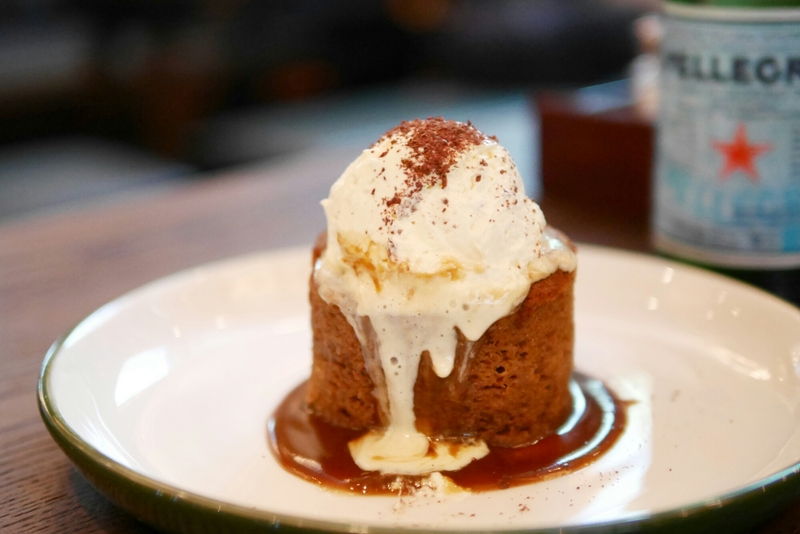 But the dramatic number of new restaurants opening up each month (or week) in Hong Kong means that some of the older ones don’t get much attention. That can sometimes be a huge mistake though… Especially if laksa mussels and deep fried camembert cheese are involved! I used to have a lot of good steak tartares in London. But the yummier ones I had in Hong Kong just happened to be the fusion type (at Viet Kitchen and Le Garcon Saigon). In the more western scene, the one at Frites is definitely among the best so far. The meat quality was excellent and fresh, while the spices used were right and the toast was crispy and buttery-ly delicious! 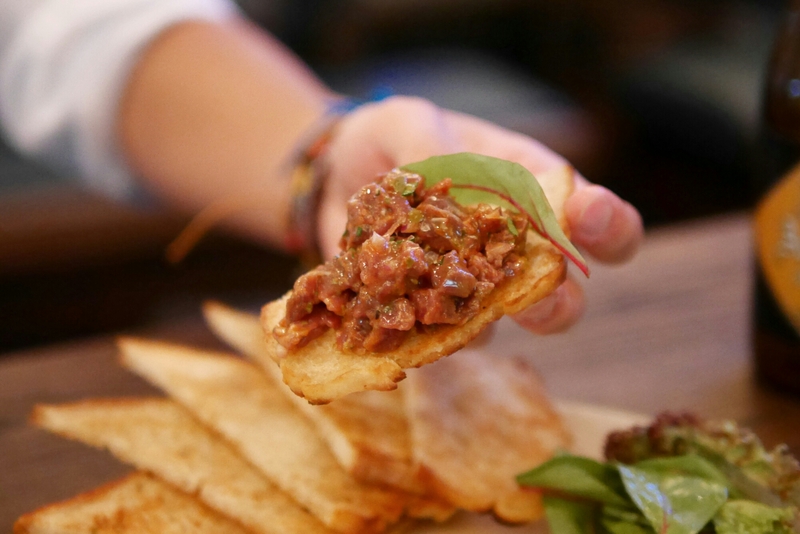 The menu at FRITES is heaven for meat lovers (i.e. me) so we were extremely stuck on what else to order… There were 3-4 competing choices just on the starters section. 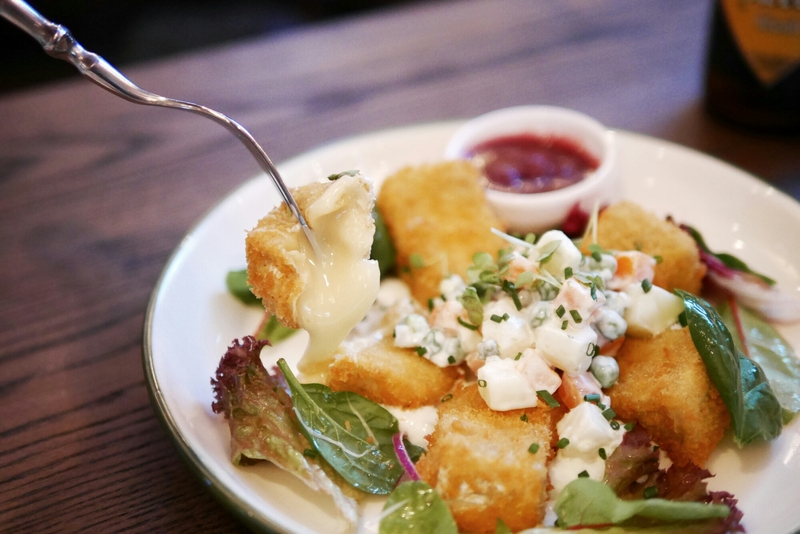 We had hugely mistakenly overlooked this non-meat dish but thankfully we asked for recommendations to solve our indecisiveness and they suggested this if we love cheese – we do! Now I’m usually not a particular fan of camembert as it’s just not as good as brie. But when it’s deep fried with a golden crunchy layer on the outside and melting on the inside, that’s a completely different story. In fact, the cheese taste alters slightly once it’s been heated. Plus it pairs extremely well with the potato salad and cranberry sauce. On seeing “laksa mussels” on the menu online, I had decided I would order this before I even arrived at the restaurant! Our decision got strong nodding approvals from the waitstaff and with so much anticipation, we were still super impressed with this dish. 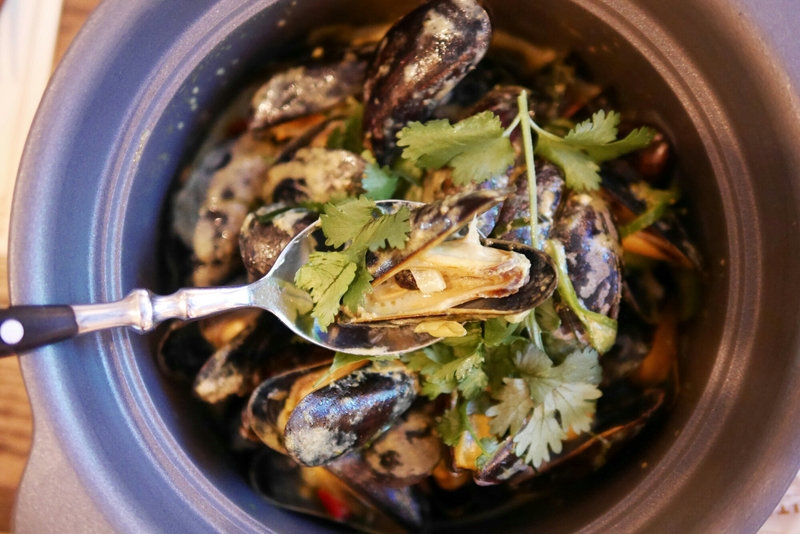 Not only were the mussels executed to perfection: super juicy, just cooked and extremely fresh, but the laksa sauce paired together as well as I could imagine. It’s a unique combination I’ve yet to see offered elsewhere. 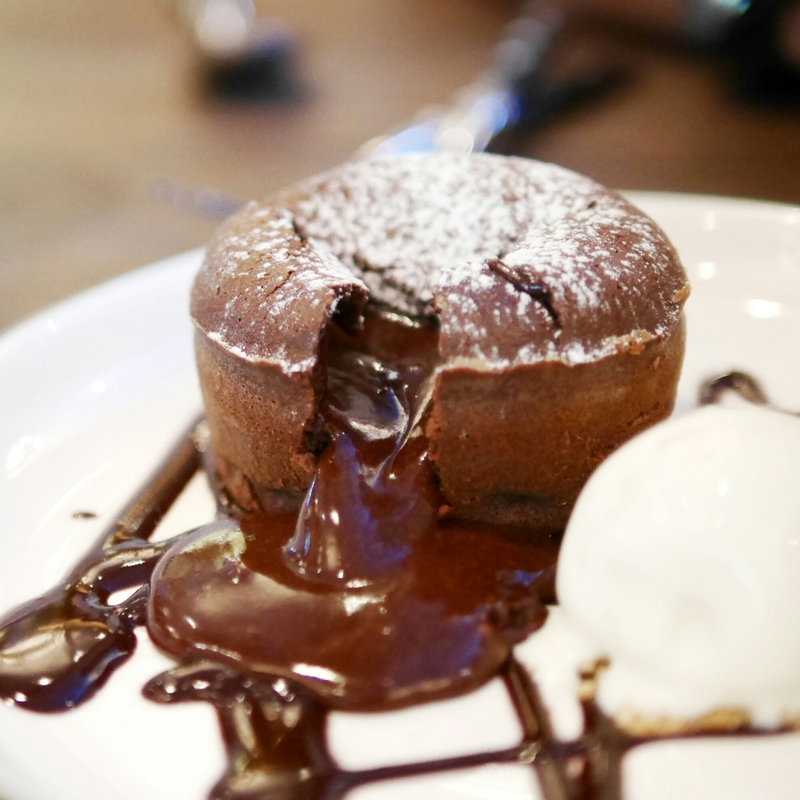 This chocolate fondant is guaranteed to satisfy ANY chocolate craving out there. Pictures speak louder than words and I think the photo shows just how much lava was gushing out. This was only the first 3-5 seconds of it! The sticky date pudding was admittedly less appealing, just because it lacked the action. But the pudding was very moist and balanced in flavours. I’d say it’s a good choice for something a tad less mainstream. I went to the new Causeway Bay branch and loved the high-ceiling spacious design of the interior. It was comfortable and felt like a social place. I would think the other branches would be similarly designed too. The seating arrangement is sharing-style, so if you’re in a small group, you might be sharing a long bench table with other people too. The portion of each dish was pretty huge and even the starters are good for sharing between 3-4 people. To sample more dishes (trust me, you would want to), I’d suggest coming here with more people. 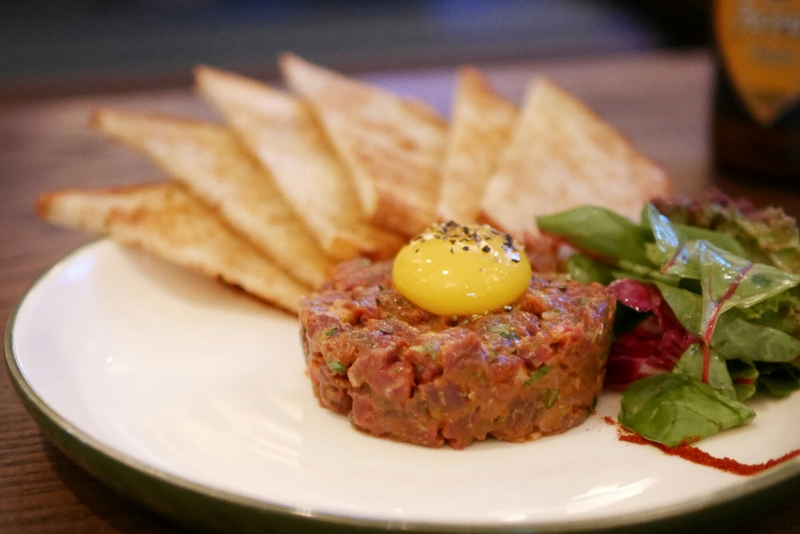 But honestly, the steak tartare and fried camembert were so good, it was so satisfying that there were only two of us to fight for the last bites. They also have branches in Central (198 Wellington Street), Wan Chai (1/F Causeway Centre) and Quarry Bay (Oxford House, Taikoo Place).